What could be cuter than a baby hippo? 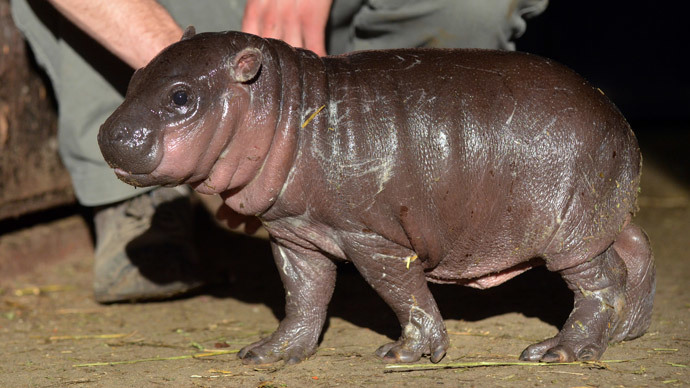 A baby pygmy hippo, perhaps? This little chap, one of only a handful of pygmy hippos in Europe, was born on Boxing Day at Whipsnade Zoo, and the staff could not be more excited. The calf’s mother, Flora, who was featured in ITV’s 'The Zoo,' was receiving treatment for a cancerous tumor in her mouth. Despite her health condition, Flora delivered a healthy baby. Steve White, a Senior Keeper at the zoo, said the little bundle of joy was just a day late. “On his first weigh-in, he was so slippery it was like picking up a big bar of soap!” he said. White also said the team at Whipsnade are extremely happy for Flora. Choeropsis liberiensis, or pygmy hippos, are on the IUCN Red List of endangered species. Teams from the international charity ZSL are working in Sierra Leone and Liberia to help protect the animals.